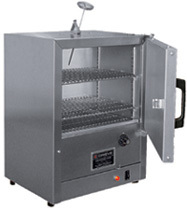 This Model LO-201C laboratory oven is a compact and economical unit. It has a work space that measures 12" wide x 10" deep x 10" high. Temperatures to 200°C (392°F). Used when a large work space and high temps. are required. Resilient silicone rubber door gasket. Work space measures 13" wide x 13" deep x 13" high. Temperatures to 270°C (518°F). The largest laboratory oven affording more than twice the capacity of the LO-201C. Work space, 18" wide x 12" deep x 16" high. Temperatures to 200°C (392°F). Work Space Dimensions: 12"x 10"x 10" 18" x 12"x 16" 13"x 13"x 13"
Outside Dimensions: 14"x 12"x 19" 20"x 14" x 25" 17"x 17-3/8"x 24"
Bimetal control thermostat sets desired oven temperature. Thermal cutoff limits maximum oven temperature. Red pilot light indicates heater operation. Top mounted dial thermometer. Primary hydraulic control thermostat sets desired oven temperature. Second manual reset hydraulic thermostat limits maximum oven temperature. Red pilot light indicates heater operation. Top mounted dial thermometer. 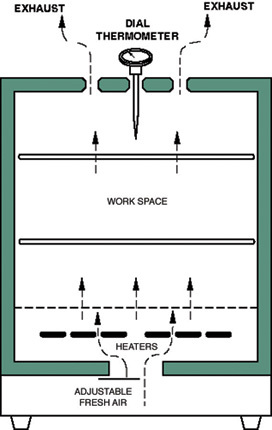 Heat is transferred from the bottom up through the oven chamber by natural convection and exits through vents in the oven top. Adjustable fresh air inlet damper at the oven bottom provides control of the amount of fresh air entering the oven. NOT FOR USE WITH FLAMMABLE SOLVENTS OR VAPORS. OTHER MODELS AVAILABLE FOR THESE APPLICATIONS - PLEASE CONSULT US. *15 lbs. distributed load per shelf. 30 lbs. maximum oven load. Each additional shelf includes four (4) support clips. These rugged bench ovens are designed for a wide variety of industrial heat processing applications. Models are available for those applications where flammable solvents or vapors will be present in the oven. Model NBS-400 - shown with optional shelves. Manual reset excess temperature controller turns off heat if oven exceeds 400°F. 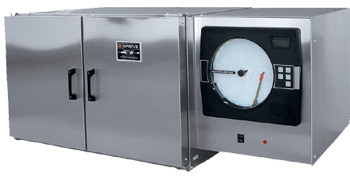 Purge Timer provides time delay to allow exhauster to pull four oven volumes of air through the oven prior to turning oven heat on. All the features of Model NB-350 combined with the safety equipment required when flammable solvents or vapors are present in an oven. 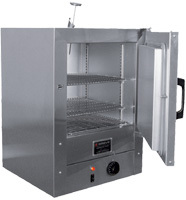 Model NBS-400 meets the requirements of OSHA and National Fire Protection Association Standard 86 for Class A ovens. Not for use in hazardous locations as defined in the National Electric Code. 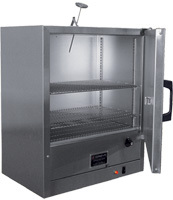 Same as Model NB-350, plus additional safety equipment required by OSHA and NFPA 86 for Class A ovens. Will handle a maximum of 3 oz. (0.024 gallons) of flammable solvents or vapors per batch at a maximum temperature of 400°F. Note: Model NB-350 is NOT for use with flammable solvents or vapors — use Model NBS-400, which includes additional safety equipment required by OSHA and NFPA 86 for handling a maximum of 3 oz. (0.024 gallons) of flammable solvents or vapors per batch at a maximum temperature of 400°F. Work Space Dimensions: 28"x 24"x 18"
Outside Dimensions: 41"x 30"x 39 "
208V and 460V Available, 115V Not Available. Available in single phase only. Economical ovens easily moved to various locations. For processing large parts, baking, drying components after cleaning, dehydration, preheating, curing and other applications requiring circulation of heated air. Outside Dimensions: 41"x 30"x 23" 41"x 30" x 23" 41"x 30" x 23"
Provides 7 cubic feet of work space at temperatures to 350°F. Includes two (2) removable nickel plated wire shelves easily adjustable on 2" centers. Holds a maximum of seven (7) shelves. Widely used for drying small items, preheating plastics, drying powdered metals, and curing potting compounds. Double doors for easy loading of large parts. Similar to Model NB-350. Also includes two (2) shelves and will hold a maximum of seven (7) shelves. Provides over 5 cubic feet of work space at temperatures to 550°F. Ideal for high temperature processes such as annealing springs and plated parts. Specially designed for processing and drying of plastic granules, powdered metal parts and other small parts that must be separated. Eight (8) individual 304 stainless steel drawers keep parts separated and allow individual inspection or removal without opening conventional doors. This reduces heat loss and prevents process interruption. Temperatures to 350°F. Standard drawers have 3/4" diameter perforations on 1-1/4" staggered centers on bottom and sides. Solid drawers also available. Calibrated main temperature controller regulates desired oven temperature. Independent manual reset excess temperature controller protects against failure of main temperature controller. On-off switch located on panel controls electrical power to oven. Red pilot light indicates heater operation. * Model NB-550 requires 30 ampere service on 115 volts. metal bottoms and sides standard, solid bottoms and sides available at no additional cost. §20 lbs. distributed load per shelf. 40 lbs. maximum oven load. Shut Down Timer, with continuous "hold" feature. 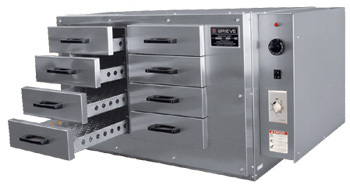 Complete line of Grieve ovens also available...CALL for current information and pricing.